Cathryn Essinger is the author of two other books of poetry–A Desk In The Elephant House, which won the Walt McDonald First Book Award from Texas Tech University Press, and My Dog Does Not Read Plato, which was the runner up in the Main Street Rag book competition in 2004. Essinger’s poems have been anthologized in The Poetry Anthology: 1912-2002, Poetry Daily: 366 Poems, and in O Taste and See: Food Poems. Her work has been featured on Garrison Keillor’s Writer’s Almanac. Her new work has appeared in such places as The Southern Review, New England Review, and Quarterly West. 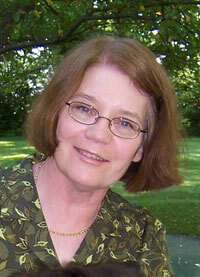 She received an Ohio Arts Council grant and was Ohio’s Poet of the Year in 2005. She is a member of The Greenville Poets, a small but well-published poetry group that does workshop presentations and supports the work of younger writers. She is a professor of English at Edison Community College, in Piqua, Ohio. David Brent Essinger (videorecording and a/v editing) teaches creative writing at the University of Findlay. Recent fiction has appeared in The Pinch, Quarter After Eight and elsewhere, including 34th Parallel (http://www.34thparallel.net/issuu4.html), The Dirty Napkin and Pindeldyboz online (http://www.pindeldyboz.com/denight.htm). He has a novel manuscript based on his exploits walking other people’s dogs in Chicago, and he ran 100 miles yesterday and can still type. Whether tapping into the secret language of dogs or mockingbirds or light, whether tuning the mind’s radar in order to detect and understand the loneliness of a mouse or the hopes of bees, whether opening up her own heart to explore the nuances of love for a son and even nameless hippies–Cathryn Essinger reminds us of the magic that exists everywhere if we just pay attention. In wise and elegant, expertly crafted poems that we have come to expect from this masterful poet, we are given the chance to rethink what it means to live in a world that both gives and withholds meaning. As I read, I felt myself opening more fully to the planet’s mysteries, regaining a sense of innocence, and learning how the world/is colored again by wonder/and mute admiration of the unknown. In Cathryn Essinger’s new book of poems What I Know About Innocence, her trademark, wit, grace and dash are put to brilliant use to explore the realities and mysteries of the world. Stories and relationships are made magical. Dogs and cats, birds, mice and bees more than hold their own with people. Babies levitate and a eulogy for a Big Blue Ball will break your heart. The last quarter of the book deals with the impact of a murder on a farming community, proving once again that a good poet backs off from nothing. 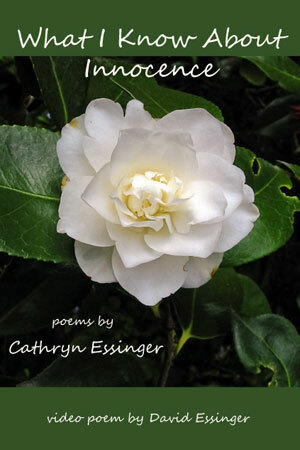 And Cathryn Essinger is one of our best poets. The whole book abounds in verbal and visual delights, told in an unaffected but highly affecting voice that sounds both neighborly and newsworthy. It’s a pleasure to be caught up in these catchy poems. alphabet block that I carry in one hand. where I have rubbed him the wrong way. Are you reading symbolism into this? like a watermark on an antique table. the water shivers at your touch? and for once in her life she is right. trucks in the street or men in the yard. the windshield that has me stepping so gingerly. that even a callused lover can learn to love. so long ago, tidy up a bit in the backseat of the car. better of–some things don’t need to be said. 10 o’clock shadow rough against my cheek. My boyfriend, he took the pictures. but I knew he wouldn’t. and put me under for a month. that can wake you up at night. in the backyard or something. right back, I know he heard the pager. anything about it, and I sure didn’t ask.